All my kids talk in their sleep. Some more often and more than others. Today, one vocal-in-sleep boy said just one word so singularly profound! I had been baking belated Teachers’ Day cookies since Friday night. Completed around 2:33am (Saturday now). After showering, I was too awake for sleep. So, I began doing some work on the laptop … until maybe 5am, when I was starting to type nonsense. Time to sleep. But earlier, before 4am, A2 said something. I couldn’t make out what he said. After some time, at 4:07am, A2 stirred and blurted out the most meaningful word for me in that moment of solitude. I know, A4 shouldn’t be up as she just had a day of fever today, her nose was still runny, and she had early Saturday morning (8:45am) Berries Chinese lesson to make up for the make-up she missed this morning (9:15am) due to fever. She was well aware that I had let her skip this morning cos she was unwell. “You won’t be. Now, just go to bed and lie down,” I said. “But what if I am?” A4 pressed on. Just six years old and she’s already mastered the art of planning to applying for medical leave from “work”! Who cares what message is sent by what is said, how it’s said? As long as it produces the same desired result, the goal is achieved! How more male can one get than this? A3 is definitely male! I agree, but that doesn’t reassure him as we have been late before, due to my staying up late to get things done and not being able to wake up in the morning. Then I remember: A4 has make-up Chinese enrichment class tomorrow. I’d be cutting timing too fine if I took both kids along to drop A3 at school for badminton, and then hop straight onto a bus – perhaps with a transfer – to get A4 to Chinese class. I further recall: Dad has his off-day tomorrow I think. “A3, go ask Kong Kong (ie Granddad) if he can take you to badminton tomorrow,” says I. “Why must I? … You ask!” A3 whines. “Just go ask! You have to learn to open your mouth and ask,” I goad (threatened), hinting at an ultimatum. A few more exchanges and I hear A3 reluctantly (I sense Mr Mature-&-Independent is shy about asking for help) saying something to his Kong Kong. Fortunately, Dad is a little hard of hearing and A3 has to repeat his request a couple more times, so I get to hear what he is actually saying. A3: Kong Kong, you have to take me to badminton tomorrow morning. A3, a bit louder: You have to take me to badminton tomorrow. A3 is exasperated, so now more audible: Mommy says you have to take me to badminton tomorrow. I fly out from the kitchen to explain things from the kitchen doorway. I to Dad: What A3 mean is can you take him to badminton tomorrow morning? Cos I will be taking A4 to her make-up Berries class in town. Dad, as usual, is more than happy to help where I am shorthanded. I had asked A3 to ask Kong Kong if he could send him to class. A3 told Kong Kong I said he had to. Both approaches would have produced the same result, that is Kong Kong taking A3 to class next morning. Only the meanings behind both messages were poles apart! A cold, demanding and ungrateful monster! That was what A3 almost made me out to be. Walking A1 to ballet, we bumped into a neighbour YY who “told me tales” of my youngest. Memorable “tales” I’m gonna drag out in my speech at her wedding some day! Apparently, when Dad takes A4 to the playground, they sometimes bump into YY walking her dog Shadow. YY stood stunned, devoid of all dignity. YY from Block 14 had already shared this story with me one morning a week or so ago. She was then taking Shadow for a walk when she saw A4 and I at the round-about pick-up point, waiting for A4’s school bus. The incident left a deep impression on YY that she simply had to share it with me again when we next met today. And I was all too happy to listen to her again. It’s such a classic real-life story of losing one’s dignity to, of all things, an animal! 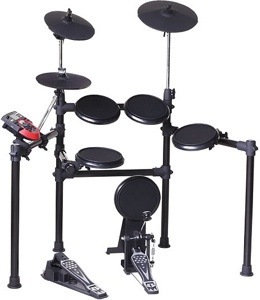 Finally purchased the digital drums set for the boys to begin private drums lessons come July with A3’s inspiring first drums teacher. Brand new purchases are supposed to be fun and exciting. But this one’s a big-ticket item at SGD1,049; and there’s always that fear that the kids will lose interest or act up till lessons get cancelled (It’s like childhood all over again, except this time we’re at the paying end). And the worse thing was the purchase process was wrought with … well, let’s just say distractions. My WhatsApp messages to S says it all. Deed done at 6:15pm with a lot of grief! While at Cristofori paying, they were all driving me nuts! A2: Mommy, it’s my turn. A3: But mommy, A2 doesn’t want to let me play. A4: Mommy, A3 pushed my head down; it’s very pain. Then there is the addition pain of clearing out and cleaning up our upstairs study to accommodate the new “furniture” (drums). Now, maybe the delivery next Tuesday night will be a more peaceful and enjoyable time. Had breakfast with three close friends (DO, YY and MC) from the kids’ kindy and primary school. We had a great long morning. Parting began only as one by one of us had to leave for various schools to pick our respective kids. We were down to just one friend DO and I when she received a call to pick one of her twins early from school. I didn’t have any kid to pick up then, so she gave me a lift home on her way. Apparently, our younger boy was spotted kneeling down to help his older brother tie his shoelace which had come undone. Like all siblings, our boys (in fact all four of our kids) play together and fight each other all the time. And like all parents, I wish they’d just get along and save me the trouble of fighting with them to stop fighting and of worrying about the state of their sibling relations. … But moments like this today give me a glimpse of the light at the end of the tunnel. Our boys love each other after all. Our four love one another after all! Kids certainly do relate to life better through play. We (A2, A3, A4 and I) came home from a night out to the newest and biggest mall playground, Westgate Wonderland. By the time the kids dilly dallied (The three youngest opened their IKEA’s Småland kids’ club newsletter which came in the mail; delayed their shower/bath; did some of the activities in the newsletter; had to eat again cos still hungry; waited for me to mop our bedroom floor before they could set up their beds as the boys camp over in our room Friday to Saturday nights; actually set up their beds; etc), it was past their usual 10pm bedtime. It was probably about 11pm. At some stage, she also used the word “re-spawn”. Both verbs have the same meaning to the correct word. I told her what the correct word is. It is “resurrected”. A4 had expressed her thoughts in Minecraft terms! She went on to express various opinions, including the idea that perhaps Jesus should stay dead and only “re-life” when He wants to, etc. She went to sleep only after she got all her thoughts out of her system!